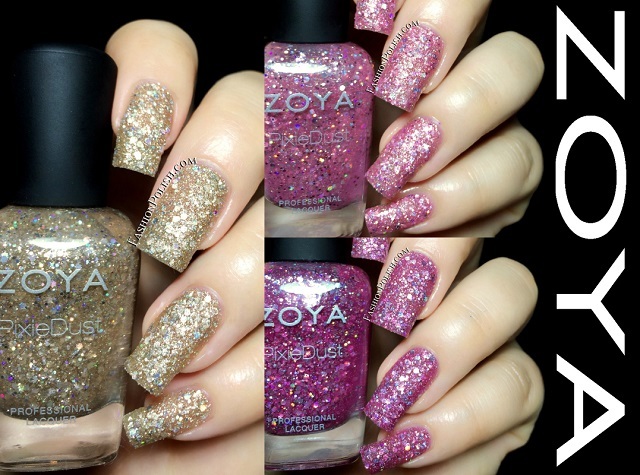 Fashion Polish: Zoya Magical Pixie Summer 2014 collection swatches & review! Zoya Magical Pixie Summer 2014 collection swatches & review! I hope you've had a fantastic weekend! Mine wasn't too bad given the weather. I still can't believe how much it rained. It feels like it's either blazing hot or pouring rain these days. Anyway, I have the Zoya Magical Pixie Summer 2014 collection to show you today : 3 new pixies with a touch of glitters! Formula was consistent on all 3 shades : slightly sheer and thick on the nails at first, they finally built up to sufficient coverage by the second coat and laid more flat as they dried. Bar is a warm sand pixie with various sizes of silver holographic hex glitters. Ginni is a soft bubblegum pink pixie with various sizes of silver holographic hex glitters. Arlo is a magenta pixie with various sizes of silver holographic hex glitters. The Magical Pixies are a fun twist on the regular Pixie collections. I do like the extra holo glitters very much but I think it's a bit too much for a full manicure. I don't know about you but I will definitely rock mine on accent nails! So what do you think about these? Did you grab any of them? Are you still into the textured look?